This week's poll asks which actor played your favorite Batman? Whether you call him "the Bat-Man", "the Caped Crusader," "the Dark Knight," or "the World's Greatest Detective" Batman rules. Last week's poll "Which Actor Played the Best Joker" was very popular, so I thought I'd switch it up and ask who was the best at playing his nemesis: Batman. 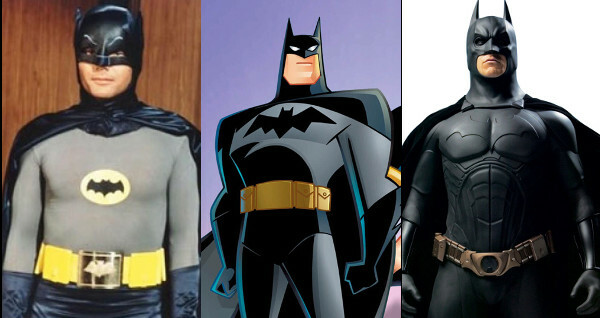 There were a number of actors that have played Bruce Wayne/Batman in film and animation. He's been an enduring character since artist Bob Kane and writer Bill Finger first introduced him way back in 1939's Detective Comics #27. Batman is a cultural icon and IGN named him #2 in their list of the Top 100 Comic Book Heroes of All Time. He's steadfast, powerful and a self-made superhero. We love him and can't get enough of the guy. Some like him dark, and some like him funny, but we all love Batman. By the way, Mark Hamill from Batman: The Animated Series (1992) won the Joker poll by a narrow 46%. Heath Ledger from The Dark Knight came in second. Come back next week for the bi-weekly Caption This! And come back in two weeks for the next poll. Do you have an idea for a poll, or have you seen a picture that needs a funny caption? Send it to us using our contact form or email us at geektwins(at)gmail.com! Joshua is a husband and father, a freelance copy editor and a writer. Caffeine, candy, and sweets are his vices. He posts some of the most clever stories about family life and also manages to post about the iconic nerd. Word to the nerd. Which actor played your favorite Batman? I don't think this will be much of a contest. Poor George Clooney. Holy miscasting, Batman! I still remember in the theater when he delivered the "I'm Batman" line and I thought, "No you're not!" Incidentally I had the same reaction watching Chris Pine in "Star Trek." i picked clooney... he didn't do it wrong, he had the jaw thing going.... right. I used to love the old Batman show with Adam West. Do I think he's the best? No, but the show's so wonderfully campy. They did have the best Catwoman, though. Or Catwomen, rather, in Julie and Eartha. The ol' bat days were a good laugh. Adam West and his sidekick did a great job keeping the show on the road. Same bat time, same bat channel. I miss that show. It was such fun. I think this should be divided between animated & live. Good point TS. I tried separating the animated from the live action before and people got upset. Plus, the Joker poll was a mix. I loved Adam West and Bale is awesome as a modern Batman. I can't give Christian Bale enough credit, but Kevin Conroy is what I grew up with.